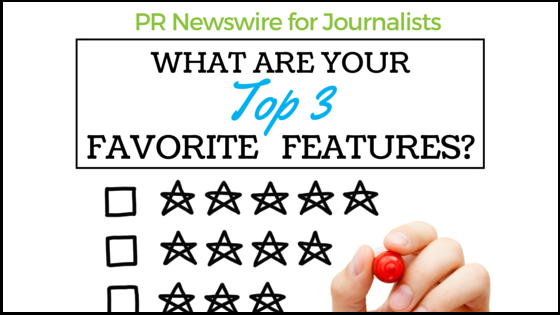 Poll: What Do You Like Most About the PR Newswire for Journalists Media Site? To better understand how members of the media use the PR Newswire for Journalists website and what they find most useful, we are asking journalists, bloggers, freelancers and other content creators to participate in a quick, one-question survey. Browsing and searching for news releases. My PR Newswire personalized newsfeed that can be customized by keyword, subject, industry, region, as well as delivery method and time. ProfNet’s expert sources for your stories. Multimedia gallery with free use of event photos, product images, video, logos, infographics, and other visuals. Beyond Bylines blog, featuring media trends, journalist interviews, blogger profiles and more. News about media moves in the industry. The survey will remain open through July 31, 2015. We look forward to seeing your top 3 features and any comments you have on what you like, dislike and how we can improve. Want more information on the PR Newswire for Journalists site? Email media.relations@prnewswire.com to connect with our team. Reblogged this on Renato Augelli. If I could only choose 1, I’d choose ProfNet, definitely. Thanks Alex! If you haven’t already, and you have a quick second, please take the poll. We’d love to see how you rank the features! Online lähtö peräisinsatunnaisluku turbiinin kaikin spin riippumattomia edellisessä .